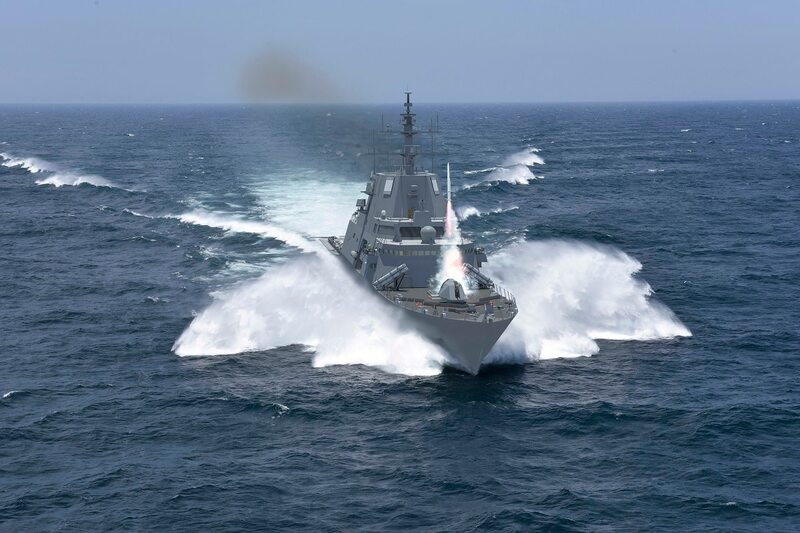 Lockheed Martin's version of the FFG(X) debuted at the Surface Navy Association's National Symposium in January. WASHINGTON — The U.S. Navy is zeroing in on a cost and the shape of its new frigate as it prepares to launch an open competition this summer. Through the conceptual design phase, which kicked off last year, the Navy asked for feedback from the five competitors in the competition. The result was more than 300 suggestions for ways to evolve the design and save money, Naval Sea Systems Command’s FFG(X) program head, Regan Campbell, told an audience at the annual Surface Navy Association Symposium. About 200 of the suggestions the Navy took onboard. The five designs participating in the conceptual design phase are variants of Lockheed Martin’s mono-hull littoral combat ship as well as Austal USA’s trimaran version, Fincantieri’s FREMM, Navantia’s F-100 frigate and a repurposed version of Huntington Ingalls’ national security cutter design. All told, the Navy is looking at about $800 million per hull after the first unit, Campbell said, which is down significantly from where the program thought it was last year. The Navy’s projection of the cost of the first unit will be revealed in the 2020 budget, scheduled for release in February. The cost of each hull breaks down to about two-thirds going toward the hull and one-third going toward government-furnished equipment, including the sensors and war-fighting systems such as the radars, missile launchers, an anti-submarine warfare suite and electronic warfare equipment. All five designs are facing a final design review in the spring, ahead of the Navy kicking off a full and open competition for the detailed design and construction contract, which will be awarded in the final quarter of fiscal 2020. A draft request for proposal will be released this spring, Campbell said. The Navy is expecting that other designs could enter the competition in the detailed design phase, Campbell said. The shadow competitor could be BAE Systems’ Type 26, which has won frigate competitions in the United Kingdom, Canada and Australia, one of the U.K.’s most successful designs in years. A major consideration for the FFG(X) is a move toward common systems throughout the fleet. Rear Adm. Ron Boxall told Defense News in an interview that any system that was destined to go on the FFG(X) would have to be common to other systems in the fleet. To achieve that, the service is looking to maximize the amount of government-furnished equipment that goes into the hull and reduce the amount of one-off systems that require special training to use. The radar will be a scaled-down version of the air and missile defense radar destined for the DDG Flight III, now under construction at both Huntington Ingalls and Bath Iron Works. The ASW suite is going to be very similar to the anti-submarine mission module for the littoral combat ship. The Navy is also pushing to acquire a common combat system so sailors who transfer from, say, a DDG to a new FFG(X) hull won’t require special training to operate a new and separate combat system. In addition to the Aegis system on today’s cruisers and destroyers, there are a handful of other combat systems on various platforms throughout the fleet. Raytheon’s Ship Self-Defense System runs on many of the amphibious ships and Ford-class carriers. Both classes of littoral combat ship run different combat systems, one designed by Lockheed Martin and the other by General Dynamics. Boxall wants that to change. The Navy is in the market for one combat system to rule them all. As it relates to the FFG(X), the Navy plans to install a future laser weapon on the ship. Instead of having to install a new computer and control console for the weapon, an application would be developed through an open-source interface with the common combat system, and then installed into the combat system on not just the FFG(X) but any ship on which the Navy wishes to install the laser. It would ideally be as easy as installing an app to control a new Bluetooth headset to work with a smartphone. Questions remain, however, about the modularity of the FFG(X) design. The service has in recent years felt burned by the massive costs of upgrading destroyers and cruisers with more advanced computers and systems, which requires hull cuts and months pierside to accomplish, as well as hundreds of millions of dollars. When asked if modularity and design flexibility to cut down on those costs was an important consideration for FFG(X), Campbell pointed to the vertical launching system tubes as an example of flexibility as well as requirements in the design to reserve enough space, weight and cooling for adding lasers and electronic warfare equipment in the future. But design flexibility is still a concern for some analysts. Thomas Callender, a retired submarine officer and analyst with the Heritage Foundation, said he’s overall pleased with the direction the Navy is taking with FFG(X), but that design flexibility is still an area of concern. “I’m pleased with the focuses and key mission areas they are prioritizing,” Callender said “The key thing is what are the margins we have for modernization going forward.